Reading through any number of headlines lately, and it seems like the vegetarian lifestyle may be the way to go for our long term health. But, for athletes whose sports put a lot of demand on their bodies, is a vegetarian diet enough to keep them fueled up and performing at their peak? Samantha Schmaelzle, registered dietitian with UW Health Sports Performance program, helps dispel some of the myths around vegetarian diets and offers tips to help ensure vegetarian and vegan athletes are getting the nutrients they need. When it comes to diet, protein is probably the first nutrient that comes to mind when planning meals for a vegetarian or vegan athlete. Athletes need anywhere from .8-1.2 grams of protein per kg body weight. For an average female weighing 135 lbs, she would need about 60 grams of protein and an average male weighing 160 lbs would need about 75 grams, assuming both are exercising in moderate amounts. Vegans and vegetarians likely have a lot of variation within their diet (read: they don't eat the same thing for breakfast, lunch, and dinner), and are probably getting enough or more than enough protein already. But, it is important to ensure sources of protein are included in each meal throughout the day and within 30 minutes to an hour after a workout. Advance planning can help. Making grocery lists, meal plans, and having food available for snacks and meals when away from home are the best ways to ensure every meal contains needed nutrients. A key word when thinking about protein is "complete." A complete protein contains all of the essential amino acids. And there are many sources of complete proteins that are great options for non-meat eaters including eggs, cheese and milk. One large egg has about 7 grams of protein and 1 cup of 1 percent milk has 10 grams of protein. Conventional wisdom used to state that complementary proteins should be consumed within the same meal, however, research suggests that it is important to obtain a variety of these items and pairs throughout the day and they don’t necessarily need to be eaten together. It is equally important to get in enough calories so that protein isn't wasted. A good list of foods and their protein content can be found on the Vegetarian Resource Group website. For vegans or those with lactose intolerance, there are dairy alternatives available but it’s important to read the nutrition label to ensure there is actually protein in the product. For example, regular 1% milk has about 10 grams of protein per cup, whereas unsweetened almond milk has only 1.5 grams of protein per cup. Soy milk would be the best choice in terms of protein at 11 grams of protein per cup. Coconut milk and rice milk both have close to 0 grams of protein per cup. Some products are beginning to add protein and micronutrients, so, as always, check the label! Eating adequate amounts of fiber is generally not an issue for vegans or vegetarians. The USDA recommends at least 25 grams of fiber per day, and this is easily obtained through a diet high in whole grains, fruits and vegetables. The catch is that some athletes can be sensitive to fiber before exercise as it can cause intestinal discomfort or diarrhea. Limiting high fiber foods before exercise may eliminate this distress. If constipation or intestinal discomfort is an issue, ensuring adequate amounts of fluids and including some sources of foods lower in fiber such as white bread, potatoes without the skin, and white pasta can help. It is also important for both vegetarians and vegans to take a multivitamin with minerals or foods fortified with vitamins and minerals on occasion. When eliminating food groups from the diet such as meat and dairy, certain micronutrients such as calcium, vitamin D, zinc, iron and B12 may be eliminated as well. A multivitamin with minerals can help as a precaution, but it is still important to eat a wide variety of foods to take in proper amounts of micronutrients to help support the body’s metabolism and ability to heal, as well as other bodily functions. 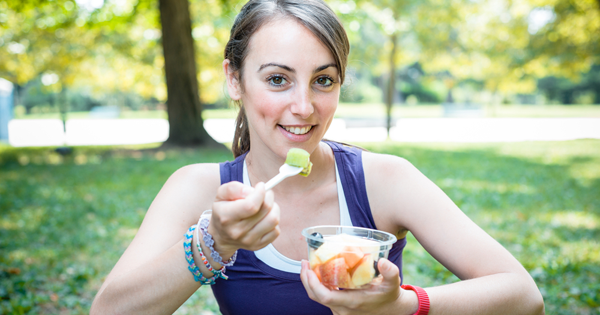 For athletes, post-exercise snacks or meals are very important for recovery. Fifteen to thirty minutes after a workout, it is important to eat a snack or meal containing carbohydrate to restore glycogen in the muscle and protein, which will aid in rebuilding the muscle. It is equally as important to consume enough fluids to replace lost fluids plus more, especially within 15 minutes of the end of the event or training. For additional ideas on what to eat to help fuel the body, check out our recent article on Snack Fuel.